Our debut class with the new, two-hole Honeycomb beads! 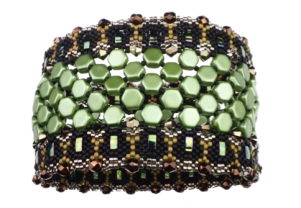 Endless color combinations in this stitched bangle bracelet – with Swarovski bicones, fire polish, half Tilas, seed beads, delicas, and the new Honeycombs! Whew! It’s going to be a fun one!